Evolution miniatures has a very good reputation with the owner of the LHS, who tells me that they sell very well. Looking at this particular figure, I can see why. 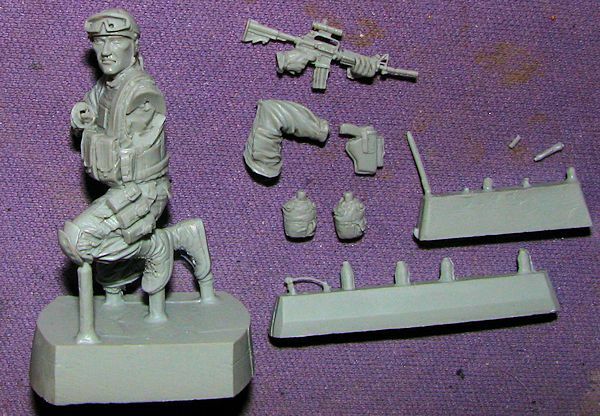 This particular figure is a Delta Force soldier as participated in the disaster in Mogadishu, Somalia back in 1993. This fellow has a pretty standard fit with his M-16, pistol and the usual stuff that these guys carry. 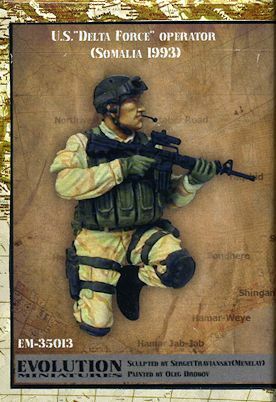 The kit includes the kneeling figure with his left arm separate. His hands and the gun are all a single mold, which is a good way to make sure there is a proper fit. Also on the sprues is his pistol and case, two water bottles and a boom mike. Actually, the boom mike is the only part aside from the main figure, that managed to remain on the sprue. The rest of the bits broke away during shipment. I am not sure if the two small rods are parts or just part of the failed protective areas on the pour stub. There are no instructions as it is assumed none are needed. Only the box art painting to help in determining where everything goes. This is also what you would use to paint the figure. In all, a very nicely molded figure for those whose skill in doing these things exceeds mine! Thanks to High Calibre Miniatures for the preview kit. You can get this kit directly from the link.